Scores.org – You don't score until you score. Until you score. You don't score until you score. Until you score. The health sector cratered yesterday on fear of ‘Medicare for All’ gutting the sector. The stock is down 13.3% so far in April, on track for its biggest one-month decline since February 2009 when it fell 30.64%. UnitedHealth shares initially rose Tuesday after it reported first-quarter earnings and revenue that beat Wall Street’s expectations. But the stock quickly gave up those gains on jitters from investors over drug pricing reform and “Medicare for All” proposals from Democratic lawmakers. Insurers were not the only companies that cratered. Pharmaceutical companies like AbbVie fell around 3%. More volatile drugmaker stocks like CRSP fell much more – closer to 8%. Hospitals fell. Drug suppliers fell. CVS took another dump. Last night Guggenheim initiated coverage on CVS at buy with a $63 price target, while this morning they downgraded Walgreens Boots Alliance to neutral from buy. There have been a couple wild health-related stories recently. Scientists restored brain some function after the death of a farm animal & in Israel they’re 3D printing organs using a patient’s cells. FNKO fell as low as $18.68 a share from a daily high of $20.06, due in large part to announcing their CFO Russell Nickel intends to step down by the end of this year. They closed at $19.09 a share – off 5.21%. They’re announcing earnings after market close May on 2. CVS was downgraded today by Oppenheimer analyst Michael Wiederhorn to market perform. The value of such a downgrade AFTER the stock slid from over $112 a share in July of 2015 to under $53 a share recently is a bit suspect. That said, a downgrade would normally cause a stock price to slide at least a bit, though CVS was up 2.67% today in spite of the downgrade. Barron’s Jack Hough published an article stating CVS is a buy, causing the stock to jump. Barron’s then published a follow up article reporting on CVS stock rising because Barron’s called the stock a buy earlier the same day. Added: Barron’s keeps doing more CVS articles & video interviews to compliment their CVS feature. And there is a not-so-subtle reason CVS may have pushed hard to couch expectations earlier this year. Another class of losers, however, would be pretty much anybody who took Goldman Sachs’ advice to sell their BARE stock just six weeks ago. Indeed, more than 5 million shares changed hands in the two days following Goldman’s early December move from the always-meaningless “Neutral” rating to the rare “Sell” rating, and the stock traded down $2, wiping out $200 million of the company’s valuation. Now, you might think such a ridiculous price would have merited an upgrade: that $2.45 per-share valuation amounted to only 3-times EBITDA, a steel-company multiple for a non-steel-company-like 70% gross margin, 28% operating margin business. Besides, if you liked it a $36.50, shouldn’t you love it at $2.45? You might think that, but you’d be wrong. In fact, Goldman kept its “Neutral” rating and thus missed a 425% rally in shares of BARE until the stock hit $13.00 a share—where Goldman’s Finest deemed the shares an outright “Sell” just over a month ago. I just bought a bit of ROKU today after multiple downgrades knocked the stock from above $70 to under $57 over the past couple weeks. Roku opened up yesterday with the broader market, but as Netflix fell on news of a low priced competitor from Disney competitor to launch in November it pulled Roku down with it. Roku is of course a smaller stock than Netflix, so the industry leader sliding would make some correlation trade algorithms push down Roku hard. That said, I think the “online video stocks” correlation pulling down Roku from a fall in Netflix makes no sense in the context of the news which drove the market today. In markets dominated by a single player, you can’t really negotiate with them, you have to accept whatever their terms are. Netflix is powerful enough they could push around Apple to skip their app store skim. A market which is rich & diverse in competitors has many more potential partners hungry for buiness, many more businesses spending on growth & many more business opportunities for Roku. As Josh Herman wrote in 2015 The Next Internet Is TV. In this future, what publications will have done individually is adapt to survive; what they will have helped do together is take the grand weird promises of writing and reporting and film and art on the internet and consolidated them into a set of business interests that most closely resemble the TV industry. Which sounds extremely lucrative! TV makes a lot of money, and there’s a lot of excellent TV. But TV is also a byzantine nightmare of conflict and compromise and trash and waste and legacy. The prospect of Facebook, for example, as a primary host for news organizations, not just an outsized source of traffic, is depressing even if you like Facebook. A new generation of artists and creative people ceding the still-fresh dream of direct compensation and independence to mediated advertising arrangements with accidentally enormous middlemen apps that have no special interest in publishing beyond value extraction through advertising is the early internet utopian’s worst-case scenario. Google certainly believed that vision when they acquired YouTube for $1.65 billion on October 9, 2006. Google made one simple calculation when it purchased YouTube: in the broadband era, video was likely to become as ubiquitous on the web as text and pictures had always been. YouTube was already, in essence, the world’s largest search engine for video. In fact, it would eventually become the second-most-used search engine, period. 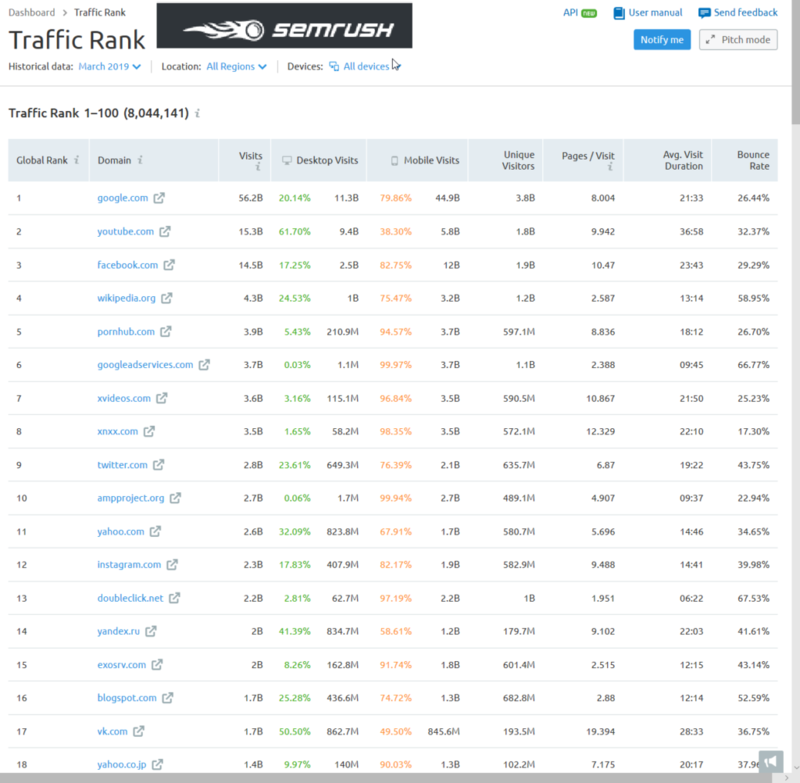 According to SEMrush traffic analytics YouTube gets more visits than Facebook, particularly on desktop. Every one of the big tech plays is investing billions of dollars in video. Apple announced their new streaming service recently, Google has YouTube, Amazon has Prime Video & IMdB Free Dive & Twitch, then of course there is Netflix. You can just see this trajectory from early internet, when the technology and connections were slow, most of the internet was text. Text is great, but it can be sometimes hard to capture what’s going on. Then, we all got phones with cameras on them and the internet got good enough to be primarily images. Now the networks are getting good enough that it’s primarily video. At each step along the way, we’re able to capture the human experience with greater fidelity and richness, and I think that that’s great. Facebook has Watch, but their past greed with low revenue sharing (their Audience Network is a joke for publishers – backfilling low CPM stuff instead of the premium tier ads on Facebook proper) has meant they have failed to get many great partners offering first-rate video content to date & Facebook Watch has not caught on widely. Facebook obtaining a music license with all the major labels could help close the gap with YouTube some, but the labels are perhaps in no rush to further commoditize music through ad-driven partnerships with big tech players given that YouTube Red has been a flop & both Spotify & Apple Music are providing vital subscription revenues that are changing their fortunes. Facebook still does not have a device like Chromecast, Apple TV, or the Amazon Fire Stick to jump into the OTT market. Better than a device, Roku’s software is being baked into many TVs, making it easier for them to align their business model with Facebook’s (ad sales vs hardware, with addressable targeted ads). And Roku is unlikely to do anything belligerent like Google in terms of forcing a row of crappy ads on a multi thousand Dollar TV. Roku would be a great acquisition for Facebook if they wanted to play catch up on OTT distribution. Plus with all the controversy around the Facebook brand on the privacy front, having a separate application would be a wise business decision. Facebook would be a natural buyer for Roku, as would Walmart or Disney. Tech companies have had rounds of infighting where Amazon for a period of time refused to sell Chromecast or Apple TV. That sales policy reversed after Amazon’s Echo stopped getting access to YouTube. Netflix recently stopped supporting Apple’s Airplay. Founders of the tech companies spend 10s of millions of dollars per year on personal security while people are being killed & third world villages are razed due to conflicts started by fake news shared on their social media platforms. In addition to the above sorts of issues, Google & Amazon have done a 1-2 punch to gut new tech start ups by copying their products and selling below cost. There might be a few companies that will hang their hat on selling an Google or Amazon powered TV, but that is a path to doom ultimately. These low-margin device makers know they need a diverse & competitive ecosystem to earn incremental revenues. They have already seen Google eat most of the profits on the mobile web. Samsung is the only Android hardware player outside of China with actual profits. They have seen Google buy & gut Motorola, have seen Google buy HTC, have seen Android go from open to closed, have seen Google security “researchers” conducting opposition research styled zero day disclosures on Galaxy phones when Google was concerned about Samsung becoming too powerful of a partner. They have also seen past resignations over TV OS fails. The big, ugly ads showing up on the operating system on a multi-thousand dollar TVs are anything but appealing. In addition to all the tech companies, Walmart has Vudu, Disney will launch Disney+ this year, Disney also has ESPN+ & Hulu, AT&T has WarnerMedia launching a service soon, CBS has all access, Comcast acquired Sky, etc. Amazon has already moved away from supporting the longtail toward focusing on the big players like HBO & Showtime. That in spite of getting a 30% to 50% rake from channels on a fast-growing, high-margin revenue stream of $1.7 billion per year. Roku has an incentive to differentiate by not only partnering with the likes of Epix, but also partnering with many longtail streaming services. Roku hasn’t engaged in any of the anticompetitive infighting the other tech companies have done. They support Google Play and many other services. Viacom paid $340 million to acquire Pluto TV. They also approached Tubi TV. Walmart owns video site Vudu & there are many other players between streaming services focused on niche categories like anime or British comedies or Korean dramas & regional players like Hotstar in India, Bilibili & Youku & iQiyi & Tencent Video in China, & iFlix in other emerging Asian markets. While the sector is largely dominated by Netflix, Amazon, and Hulu – PwC said SVOD revenue accounted for 79.6% of OTT revenue in 2017 – niche players are increasingly making a dent in the overall business. PwC noted that anime and manga service Crunchyroll reached 1 million subscribers in 2017, streaming more than 1.5 billion minutes of content per month, while U.K.-centric BritBox reached 500,000 customers. All the capital allocation being pushed into securing exclusive content rights & creating video subscription services will eventually create subscription fatigue, which in turn will drive consumption back toward free services. But there will be HEAVY marketing spend before that subscription fatigue sets in. Those who have already dumped 10s of billions of dollars are going to dump millions more into marketing. Could you imagine the investor response to a quarterly result where a management team states they are going slow & conservative & are not worried about low growth at their big new category they’ve dumped 30% or 50% of their market cap into? YouTube and Hulu have been growing their streaming TV offerings while Sling & DirecTV haven’t really been growing recently. Frequently YouTube has a popover offering an ad free experience & they even sometimes do nasty stuff like unskippable midroll ads in the middle of songs! That horrible user experience probably ends up being a subsidy to Spotify, YouTube downloader services & anything Napster-like still on the market. Those streaming TV growth rates are likely to slow further as lower cost competitive movie streaming services launch & early price subsidies for skinny bundles of live web TV services go away. Google has cut back on YouTube TV subsidies, recently raising prices to $50 per month. The skinny bundles are ultimately a bad deal for those who get news free from online channels. Other than sports, there isn’t much reason to pay 3x Netflix price or 8x Disney Plus price when the other services offer an essentially limitless pool of content to consume. And their replacement OTT service has already begun shrinking! If their Time Warner / WarnerMedia acquisition is viewed as disastrously as the DirecTV acquisition was they are screwed. AT&T absolutely can not afford to launch a streaming service that fails to take off or they’ll likely create a cycle of doom that could impact their mountain of BBB rated debt. If the rating falls their will be forced sellers of their debt, spiking yield on any debts they roll over. That increased debt service cost could in turn make many investors think their dividend is in jeopardy & that doesn’t work when the stock has been sliding for years. Being a neutral party not tied to a mammoth monopolistic tech play, Roku is likely to be seen as a low-risk distribution point in the same way that Apple was to music labels with the original iTunes store when Apple was a niche computer & computer accessories maker near bankruptcy. Further, the companies launching video subscription services have spent 10s of billions of Dollars on acquisitions while also nixing some of the licensing revenues they may have obtained from third party services if they didn’t keep key content as differentiated exclusive content on their site. the narrative of growth (at any cost!) will be vital for these firms, so they will spend a lot to advertise on Roku & offer Roku competitive deals for sharing revenue on streaming partnerships. Video subscription services will be forced to lose money buying growth, which will make the ad rates on Roku’s interface jump. The new video streaming services will be desperate to sell the growth story at any cost, because they’ve already spent 11 figures (or 12 collectively) on their plays in the market. This is similar to the VC fueled bubble currently going on in online mattress sales, or the VC fueled bubble between daily deal sites like Groupon & LivingSocial about a decade ago. The massive marketing push we will soon see will be funded by rolling over debts & using cashflow from adjacent telecom & cable markets rather than venture capital, but a lot of that money will still spill onto Roku just the same. When subscription mania washes out, there will be more ad-supported video available to stream on Roku. And with YouTube keeping 45% of ad revenues, it won’t be hard for content creators to prefer Roku. Disney said it has reached a deal to give Disney+ prominent display with Roku users. Laura Martin of Needham & Co., in a research note Tuesday, said that Roku will get a share of the revenue generated by people signing up for the new service. That revenue share plus an increase in advertising could be worth $200 million a year and could boost the market value of Roku by 15% or $1 billion, according to Martin. Disney had a big 10% pop today after they promoted aggressive pricing ($6.99 a month or $69 a year) on their Disney+ streaming service and made it clear they were all-in on launching a successful streaming service. Disney has given producers approval to make a big-ticket “Star Wars” spinoff series that will bypass theaters and TV and go directly to the service. It is offering bonuses for the services of directors and showrunners to work on the offerings it thinks it needs to lure customers away from Netflix. And it has told its software developers to dial back other projects to make sure the service can handle millions of subscribers when it launches. Of course the $71.3 billion acquisition of Fox already made the above statement clear, though somehow the market still needed some sort of reassurance after the failed DisneyLife experiment in the UK a few years ago. The low pricing in particular really puts the screws to Netflix as Netflix is heavily debt fueled & announced their largest price rise in the history of the company in January. They’re regularly testing consumer elasticity, but consumer preferences may shift quickly given that their biggest competitor launching in November will now charge about half their rate for a competing service. And that is a smart move on the pricing front because you can always raise prices later, but any lack of traction will kill the stock & any lowering of the price will be seen a desperate attempt to revive a failed experiment. Disney will “likely” intro a discounted bundle of Disney+, ESPN+ and Hulu, Kevin Mayer, chairman of the company’s Direct-to-Consumer and International segment said Thursday — which will give the company additional levers to play with. With Disney Cruise Line vacations costing more than $5,000 for a family of four, Disney+ need have only a marginal impact on cross-selling its subscribers to blow away the isolated lifetime value of a Disney+ subscription. Disney will also be able to use Disney+ to directly sell film tickets (cutting out brokers such as Fandango), reduce the share of its vacation packages that are sold by travel agencies (which also take a large cut of revenues), grow its direct-to-consumer merchandise sales (v. selling through Amazon), reduce its marketing spend via on-platform advertising and user-interest level targeting, and so on. Netflix is off about 4% today while Disney is up 10%. The same thing happened with Zillow when they tested the ibuying market. Jim Cramer was convinced their new lines of business like the iBuying service wreaked of desperation & were unbecoming, but after they changed CEOs back to co-founder Richard Barton and promoted the narrative of the $20 billion opportunity ahead of them the stock jumped big. Even if “only #1 players will survive” is capital talking its book to justify its own importance, that view is still seen as common knowledge today. In an era of network effects & many winner-take-most styled markets, being seen as doing a bit of this & a bit of that is seen as unfocused strategy destined to lose. Yesterday President Trump tweeted mad hate against Europe, promising tariffs. The European economy is structurally weak & they can’t afford to exit negative rates & quantitative easing. Across Europe German manufacturers are already calling the shots trying to minimize the fall out from Brexit. Now would be an inopportune time for curtailing the export-led engine of Europe. Does Trump have a deal ready with China, so he can afford to beat up on another player? “Within the four weeks — or maybe less, maybe more, whatever it takes — something very monumental could be announced,” Trump told reporters in the Oval Office ahead of his meeting with Liu. “A lot of the most difficult points, points that we didn’t think we could ever do, or we wouldn’t agree to on both sides have been agreed to,” the U.S. president said. “We have some ways to go, and I think we have a very good chance of getting there. Given the impact, not a minor issue. 2 ways to accomplish a deal – one will likely result in collapse of the globalized economy that underpins elites’ wealth, the other will likely result in the biggest global economic boom since immediately after WW2. or is he trying to redirect attention away from Boeing’s recent engineering disasters with their MAX plans that had literally zero redundancy on vital systems? That (non)safety performance appeared to have landed them precisely zero sales last month. If the HKD is strengthening it could presage a trade deal with China where China makes additional purchase commitments along with a deal to slowly increase the value of the Yuan against the Dollar to end the trade war. IF that is correct, there is likely to be a significant repricing of risk assets upward. If it is not, look out below. I have traditionally liked stocks related to web stuff (as I understand the markets well) or sort of boring old line beaten down value plays or the intersection of both (like eBay & Zillow in Q4 last year), but it might make sense to buy a bit of higher beta plays betting on at short term run. There might also be some upside in heavily beaten down near-commodity good branded plays with global supply chains. Newell Brands (NWL) could run, given it is off over 75% from where it was in early 2018. Tupperware (TUP) has seen a similar cratering in recent years, going from a 2016 high of over $95 to now trading below $27. If these sorts of stocks make even a 50% retracement of that slide you are talking a more than doubling in share price. Seagate (STX) has recovered about 40% of its decline last year while Western Digital (WDC) has only recovered about 25% off a much steeper decline. Update: the trade war with China might be settled (or at least partially settled). Before he took the fight hard to China he renegotiated NAFTA with Canada & Mexico to prevent dumping in an adjacent economy within a free trade zone. I don’t think he would keep hinting about tariffs on Europe UNLESS the China trade deal was a done deal with only formalities remaining. I recently read the book Clash of Empires: Currencies and Power in a Multipolar World written by Charles Gave & Louis-Vincent Gave. It is a great read. No fluff. Quite short with many charts backing up the concepts & on point analysis. Here are a few of the key themes & notes I took from the book, combined with some of the related themes I have sort of read online. Their book is at least directionally bullish China (along with nearby emerging markets that will likely benefit from a halo effect if their China thesis holds true), extremely bearish Europe & perhaps at best neutral to the US in the short term with more of a bearish take in the longer run on the US (due largely to the relative rise of China). Perhaps the directionally opposite take would be Kyle Bass as expressed in multiple interviews on Real Vision. Europe is largely uninvestable in its current incarnation – particularly bonds & banks. Some of their exporters might be ok, provided they export globally & their production isn’t in a category that is increasingly being competed with by Chinese producers. The common currency has prevented interest rates & exchange rate changes from being able to adjust to bring the economic system toward equilibrium. While Germany appears financially healthy relative to other European economies, the common currency has meant Germany has had to play shell games to subsidize increasing levels of debt at the periphery. Non-Euro denominated European equities have recently started to outperform Euro denominated assets. The strength of the German economy has pulled down rates for other countries across the European region, which has made debt servicing costs lower than they were before integration. Integration has been financial, but there has been no political integration. Any major recession risks collapsing the European Union. Should the German Deutschmark return, other countries will choose not to pay their debts or to pay debts in a currency of their choosing. With that in mind, Germany might have made more malinvestments than China has. Should there be a break up of the Euro it would not only be deflationary, but many of those debts German firms are sitting on could be worth approximately zero – the equivalent of taking some of their past production and dumping it directly into the ocean for no gains. The waves of immigration will only stoke national differences & ultimately can not offset the aging demographics impacting the area which further slow economic growth. Ricardian innovation – standardized integration & building of infrastructure – has ended as a source of growth across Europe with the Greek debt crisis, Brexit, Russia annexing the Crimea, & Turkey being a proverbial thorn in the side. Africa & the Middle East remain unstable. If the European empire can’t expand geographically then the low hanging fruit has already been picked. Their Schumpeterian innovation is also more than a bit suspect given increasing regulations over the online economy which are hurting domestic European startups & acting as a subsidy toward the largest multinational players like Google & Facebook. EU venture capital deals have fallen off a cliff after GDPR & that is before the impacts of Article 11 & Article 13 kick in. Negative interest rates further act as a kick in the face of innovation by keeping zombie firms alive & promoting financial speculation over fixed capital investment. The United States is also facing an aging demographic profile. Elevated debt levels further constrain growth & high deficits crowd out other investments. Recent promotions of modern monetary theory are a symptom of wanting to keep high defense spending with a broad-based welfare state without the associated required level of taxation. Foreign central banks have stopped building reserves over the last 7 years & are no longer funding United States deficits. Foreign firms which took on Dollar denominated debts may be paying back debts. The global monetary base fell over 7% in 2018, which is part of why almost all asset classes performed poorly. When global reserves fail to grow typically riskier assets underperform lower risk assets, while foreign assets also underperform US assets. When central banks reserves rise again US assets may underperform foreign assets. If central bank reserves grow rapidly the Dollar should fall significantly, with US commodity producers and other exporters being the beneficiaries of the shift. Pension obligations make some high cashflow businesses have no ongoing value if they are not able to either find new growth markets or aggressively pay down debts while interest rates are still relatively low. Heavy stock buybacks amplify earnings per share while the economy is healthy, but will also amplify losses per share when the economy turns. Debt saturation makes the economy less dynamic and makes debt-larded companies less able to cope with dynamic changing markets as debt is the opposite of optionality. Some private equity plays like Toys R’ Us are a good example of how private equity driven debt can drive an otherwise solvent firm into insolvency. Debt saturation makes the entire economy less dynamic. And if investors make more by speculating in existing assets (financial engineering) then there is less funding available for genuine innovation. Quantitive Easing, ZIRP & even NIRP have lowered the discount rate on investments where returns are highest in the far out future. This in turn has shifted investor preference away from income toward growth by reducing the risk premium placed on growth. It also shifts the economic pie away from wage earners toward asset owners who see the value of their financial assets increase due to central bank intervention putting a bid under the market. They describe 3 examples of innovative approaches & suggest the third is the path which remains available after elevated regulatory attention to the impacts of tech companies. The U.S. stock market hosting many intellectual property rich growth businesses that have appreciated dramatically since the Great Recession have pulled in a lot of foreign capital. High cashflow but slow growth businesses have been to a large degree deemed as having low residual value while businesses engaged in creative destruction of adjacent markets re seen as having high residual values. If & when markets are allowed to normalize, the high value ascribed to money-losing growth businesses may come back to Earth while value stocks may outperform. They argue the sell off in Q4 of 2018 was the end of this valuation dichotomy. The flood of IPOs in 2019 may further prove them correct as investors now have a glut of supply of new growth stories to invest in at perhaps multiple hundred of billions of Dollars in valuation between entities soon headed to market including: Zoom, Pinterest, Uber, Airbnb, Slack, Postmates, PagerDuty, Cloudflare, Bumble, Crowdstrike, Palantir, Peloton, WeWork & many others which add to the selection of FANG, BAT, and many others that have listed over the past year or so including Spotify, Snap, Twilio, Zendesk, Match & other existing tech plays. It is unlikely the Dollar would lose reserve currency status anytime soon. The title of the book does however hint at how the world could become multipolar. The rise of any legitimate competitor to the Dollar would ultimately be a negative for demand for the Dollar, even as the Dollar retains reserve currency status. The ability to price trade in other currencies enables countries to ensure they have adequate reserves to buy vital commodities like oil without needing as much Dollars on hand to pay for those commodities. Weaponizing the Dollar by fining foreign firms could hasten the decline of the Dollar’s reserve currency status, or at least encourage other foreign parties to denominate deals in other currencies. President Trump is trying to reduce the trade deficit with China by adding uncertainty to global supply chains in order to try to drive production onshore. If the United States works out a trade deal with China it could shift winners & losers across investment classes, with emerging markets outperforming U.S. equities & value stocks performing better than growth stocks within the United States. If the trade war is improved through purchase commitments that would help rustbelt states by boosting commodity purchases. If the trade war is settled through a revaluation higher in the Yuan global asset prices should increase. China stopped recycling trade surpluses into U.S. treasuries after the Federal Reserve commenced their second round of Quantitative Easing & instead promoted their Belt and Road program while opening up the Chinese bond market to foreign investors. In light of the 1989 Tiananmen Square massacre, China has a similar fear of stoking inflation that Germans with a memory of WWII have. They also recall how the Plaza Accord caused the Japanese economy to pop, so should China strike a deal with the United States to revalue the Yuan they would ensure any currency appreciation happened far more slowly. China is trying to build a parallel to the Dollar by promoting the pricing of gold, oil & other key commodities in Renminbi. To offset the US naval strength China is trying to build a land-based alternative integrated trading zone using their Belt and Road program. Historically Germany has promoted outsized returns to rentiers & bondholders while the United States has promoted outsized returns to entrepreneurs & equity holders. Like Germany, China views their currency value & bond markets as far more important than their equity markets. China closing their equity markets during the 2015 summer sell off eroded foreigner trust in the ability to invest inside China. To this day many Chinese companies (including Baidu, Alibaba & Tencent) still list their stock in New York vs Shanghai. Many new Chinese tech companies also prefer listing in Hong Kong (like Xiaomi) or New York (like Pinduoduo) over Shanghai. As China views their currency & bond markets as critical, they are likely to try to keep adding stability to those markets to push down rates, which in turn will pull down rates in other emerging Asian markets, making some of their relatively high yielding bonds a compelling bet when compared to low-yielding fixed-income investments in developed western markets. Inept politicians inside the United States have also drawn Russia closer to China, as ire that might be more appropriately focused on China was placed on Russia because the U.S. does not have highly integrated supply chains running through Russia. If Germany should choose to have close relationships with Russia the US would likely promote military guarantees to Eastern European countries which would be discouraged by a strengthened Russia. As Germany leads the EU, if China can improve ties with Germany & can get Saudi Arabia to start pricing oil in Yuan then the US Dollar would face major headwinds. As Chinese growth has slowed & their economy has underperformed they have in successive waves liberalized markets: labor, real estate, & commodities. As they liberalized markets people who speculated on the newly liberalized category performed well. Their next market to liberalize would be capital. China is still heavily reliant on the United States & Taiwan for semiconductors. China has invested aggressively, engaged in aggressive IP theft, used antitrust to block mergers while forcing foreign firms to invest in China to try to close the gap. Semiconductor firms may face margin pressures as they eventually lose access to the Chinese market & then end up increasingly competing against heavily subsidized semiconductors manufactured in China. Walgreens (WBA) announced results where they slightly missed top line revenues & missed earnings. Net income fell to $1.16 billion, or $1.24 a share, from $1.35 billion, or $1.36 a share, in the same period a year ago. Excluding nonrecurring items, the company said adjusted EPS declined 5.4% to $1.64, below the $1.72 that FactSet analysts were expecting. In addition, to complete a near perfect quarter, they also lowered forward guidance to suggest they would likely be flat for earnings year over year, down from an estimated increase of 7 – 12%. They might have another down day or two, but this feels a lot like AT&T trading at around $26 a share last year. On a related note, they also mentioned they saw no need to do any sort of bet-the-company acquisition at any price sort of transformative buying spree, which certainly makes sense given the market’s reaction to recent CVS acquisitions. I wasn’t sure if the recent results and the deteriorating backdrop of the retail pharmacy industry would change your views on M&A going forward? No. Our view is still the same. We are not close to any deal provided the price is right. We don’t see any reason to use our cash overpaying for something just because there is a deterioration of the market. If anything, we have to be more careful now when we buy something because if we don’t believe that the market will turn around, we have to action more carefully. Honestly, we still believe in this market. We still believe that this market is a market for the future, a big market with continuous growth, but to buy something, we must be sure that the money that we employ will come back sooner or later. Political gridlock appears here to stay. Here are a couple “Presidential” tweets from today. “I haven’t seen any Democrats down here at the Border working with us or asking to speak to any of us. They have an open invitation. We are getting overrun, our facilities are overcapacity. We are at an emergency crisis.” Art Del Cueto, National Border Patrol Council. Healthcare has been underperforming on the risk of any sort of price transparency. On Twitter yesterday President Trump suggested healthcare reform would happen *after* the 2020 elections. Everybody agrees that ObamaCare doesn’t work. Premiums & deductibles are far too high – Really bad HealthCare! Even the Dems want to replace it, but with Medicare for all, which would cause 180 million Americans to lose their beloved private health insurance. The Republicans are developing a really great HealthCare Plan with far lower premiums (cost) & deductibles than ObamaCare. In other words it will be far less expensive & much more usable than ObamaCare. Vote will be taken right after the Election when Republicans hold the Senate & win back the House. It will be truly great HealthCare that will work for America. Also, Republicans will always support Pre-Existing Conditions. The Republican Party will be known as the Party of Great HealtCare. Meantime, the USA is doing better than ever & is respected again! Of course his position is ridiculous grandstanding, as he had both branches of Congress for 2 years & other than repealing the Obamacare mandate mostly left healthcare alone. In fact, even the risk of Obamacare being overturned on any level caused the New York Times to publish an article a few years back about how that could adversely impact the McJobs healthcare paperwork jobs engine. Collectively we are willing to blame anybody but the correct party. The administration seems less concerned about the effect of foreign drug pricing systems on patients than with their presumed effect on U.S. prices. The president attributes high drug prices to “foreign freeloading.” Americans pay more for drugs, he suggests, because the Greeks pay less. But if the president is looking for a government to blame for distorted U.S. drug prices, he need look no further than our own. The federal government requires manufacturers to pay rebates, grant discounts, and comply with various price-distorting directives across a range of programs. Purdue Pharmaceuticals can quietly push assets into different divisions or file for bankruptcy while the Sackler family threatens the press. Even fentanyl from China remains largely unaddressed in spite of the ongoing trade war. Neither side of the political aisle wants to hand the other a political win on healthcare. Any win would be political red meat & optics matter more than anything. We are literally seeing the return of medieval diseases. Like Trump, Nancy Pelosi is in no rush to fix any of the major issues in healthcare. Markets look broadly up so far. I sold Kroger (KR) near open. I also sold off most my MMYT position. With the stock market going up across the board I didn’t want to chase, so there weren’t many of the stocks I liked that had easy buying opportunities. I just bought a bit of Enova (ENVA). They are one of the few publicly traded lenders that do check cashing / payday loan type of business. They’ve recently sold off with other financials. The mainstream financials sold off on the flattening of the yield curve which lowers their spreads, but with credit card interest rates at all time highs that yield curve flattening shouldn’t have the same sort of impact on Enova as it would on an auto or house or education lender. Bed Bath and Beyond is up huge on rumors of activist investor involvement where they may push to oust the entire board. One last hoorah for Wayfair as they are now opening a physical store at a mall. A bold move for them would have been using their extremely rich stock valuation to buy out someone like Bed Bath and Beyond to immediately have a big footprint in the offline world & to have many locations to lower customer delivery costs. Weyerhaeuser (WY) slid hard shortly after open, so I increased the position size on it & then after turned up sold it. Petmed Express (PETS) and Funko (FNKO) were both strong today, so I sold out on those as well. A 5-day chart of PETS shows how ridiculous the stock action was. I flipped a bit of MMYT at a profit, though am still holding a mid-sized position which is down a couple hundred (though far less than I have made on that ticker so far this year or what I made on it last year). MMYT has limited trading volume, so when you couple that with an emerging market growth stock, volatility & spreads can be quite high, so you need it to move a bit to make up for the bid/ask spreads. I am holding a bit of Newmont (NEM) still along with a tiny position in Kroger (KR) I just established today. My CVS & Walgreens Boots Alliance (WBA) are still off a bit, both having stunk once more today. If I didn’t already have positions in them I would buy with size at current prices. Walgreens announces earnings next Tuesday. A big part of why WBA sold off was in conjunction with the bad quarter & write down CVS belched out recently. If Walgreens reports anything other than absolutely horrific quarter on Tuesday I think they’ll likely gain at least a couple percent & could see them gaining as much as 5%. It appears as though Winnie the Pooh has figured out the market. On ultra dovish Fed the market jumped slightly & then sold off, then was on fire the following day & on day 3 just ahead of a weekend it appears to have changed directions once more. Yesterday even some low beta value plays were up 2 or 3 percent. Today many of those have given back a percent or more. I sold my remaining Kroger (KR) near open & they’ve since slid a bit. Yesterday I sold my remaining Weyerhaeuser (WY). 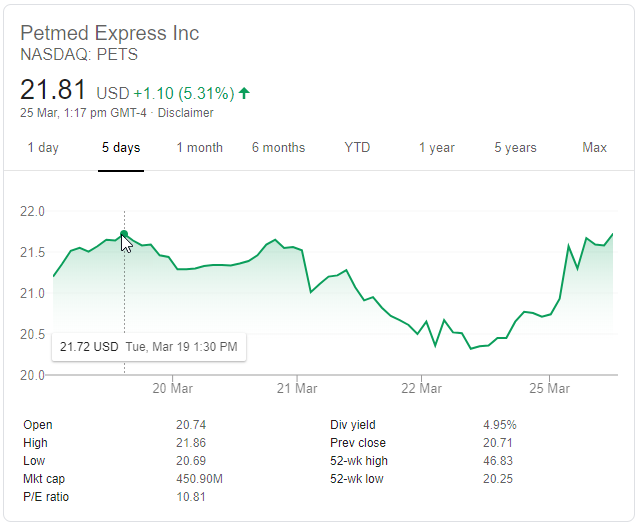 One of the stocks that didn’t take part in the rally yesterday (& in fact slid a bit) was PetMeds Express (ticker symbol PETS). They trade at about a 10X P/E ratio & are close to the 2018 December panic lows. They have no debt & about a quarter of their market cap is cash on hand & inventory, so their actual PE is closer to about 7.5 or 8. Their dividend yield is above 5% now. They actually slid a bit more today & were within pennies of new lows before jumping a bit. The thesis for why they would be a doomed value trap with no hope would be that Chewy keeps eating marketshare (more memorable brand name, faster growth, sells a broader array of products, is playing the Amazon.com growth over profits model, etc.) as the debt-levered parent company PetSmart got a reprieve from genuine market prices on debt as the Federal Reserve hinted at the QE lite program they’ll soon engage in. On the surface, the sharp decline in 2 year yields did not seem to make sense following the FOMC decision. After all. the Fed was dovish but did not show signs of cutting rates, but the 2-year yield went through the fed funds rate. That did not seem to make sense. However, when taking into account the QE-lite policy that will heavily skew toward the short end of the curve, the move makes more sense. Not to mention when taking into account the lack of FOMC conviction on returning to hikes, the decline in the 10-year also makes sense. … This might be one of the more underappreciated FOMC decisions in recent memory. The Fed is unequivocally retreating from any further tightening for the foreseeable future. How powerful will QE-lite prove to be? That is difficult to answer, but it is likely to show itself most forcefully in the dollar and lower short-term yields. PetSmart’s owners thought embracing e-commerce would keep it competitive in the age of Amazon. Two chief executives and $3 billion later, they’re discovering it takes a lot more than web smarts to outrun an avalanche of debt. The nation’s leading pet supplier has to figure out how to pay $8.1 billion in bond and loan maturities even as its sales and margins are shrinking. Half that debt traces back to a 2015 buyout led by private equity firm BC Partners, whose bidding was so aggressive that it actually topped its own offer to seal the deal, leaving veteran rivals agog at the final price. The self spin off of a 20% stake in Chewy.com will likely mean the entities largely operate as parallels, rather than as a synergistic whole. PetSmart’s bondholders had been expecting a spinoff of some of the equity in Chewy.com for months as the performance of PetSmart’s brick-and-mortar stores lagged behind while Chewy.com continues its rapid growth. The company’s same-store sales have been falling for several quarters. By contrast, Chewy.com’s revenue jumped 81% to $760 million in its most recent quarter. Despite surging sales, the e-commerce business is still losing money. That makes the justification for larding up so much debt on the company sort of moot (at least until the debt can be restructured & they force losses onto bondholders to lower the overall debt load). But seeing declining in-store sales, mounting losses on their online play, ongoing legal disputes with bondholders, etc. … Add that to the huge wave of IPOs that will come to market (Uber, Lyft, Slack, AirBNB, etc.) before Chewy.com could be fully spun out & an Amazon.com that is using ad revenues & cloud hosting profits to compete on prices … I don’t see how Chewy.com could IPO anytime soon. Virtu was off a couple percent today but quickly recovered. Anytime the market keeps bouncing back and forth that one is frequently a solid play for a quick gain if it slides, as eventually some figure the outsized day to day churn ends up leaving more meat on the bone for an HFT market maker. Virtu sold off more in the July to October timeframe & then started improving as the broader stock market sold off. It looks like the market had a delayed reaction to the Fed’s move & that Wayfair put I bought the other day just shot the moon. Great company, no idea why they’d sell off especially hard in a sell off. I mean, the fundamentals are utterly fantastic. Last year, Wayfair’s operating expenses grew 8.5 percentage points faster than sales, causing operating losses to double. 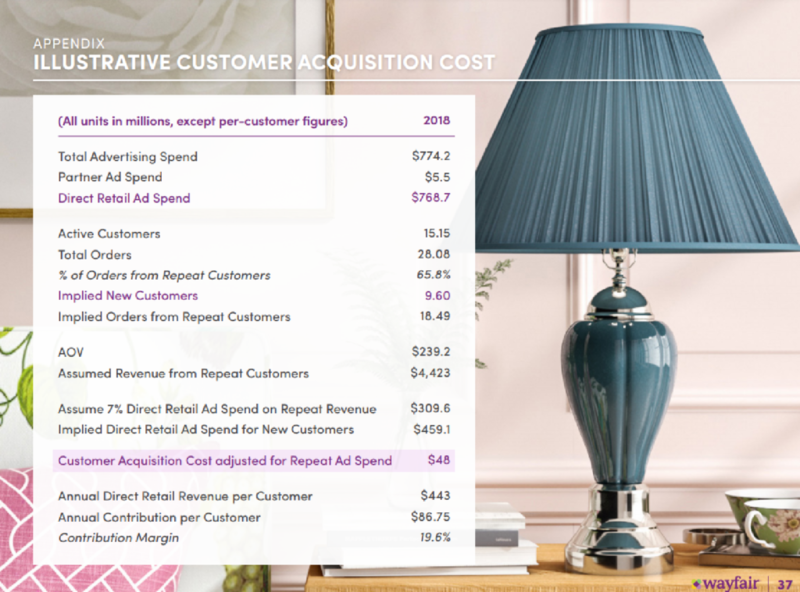 Despite this seeming lack of operating leverage, not all of Wayfair’s cash expenditures are accounted for on its profit and loss statement. Deep in the weeds of its 10-K, Wayfair discloses that it capitalises its “site and software development costs”, before amortising the asset over two years. In 2018, this had the effect of reducing operating losses by $63m, all else being equal. … In the face of less predictable and lumpier revenues, the market seems to think Wayfair’s future deserves the loftiest of valuations. Excluding Amazon, Wayfair’s 2.3 price-to-sales is higher than all its rivals, including The Home Depot, RH and Bed, Bath and Beyond, according to S&P Capital IQ. Of this bunch, it also has the second lowest gross margin — just 23.4 per cent — behind pseudo-crypto company Overstock. Options are so much harder to trade than stocks because their value decays so fast unless the trade works out quickly. Wayfair aggressively promotes their growth narrative while their CEO sells ~ $5 million in stock each week & the shorts have been getting killed for years on it. Demand is highly cylical and intimately tied to housing sales. Supply is often highly geared (e.g. DFS ‘buy’ now and don’t pay for a year) and dependent on credit sales (4 year or more) with a consequent high risk of default. Unlike cars, second-hand repossessed sofas have minimal value. People buy furniture when they move house, and if and when it falls apart. It’s surprising how long you can make a sofa last, and tables can last forever. … Nearly all the furniture retail companies I have profiled over the years have gone bust, no matter how big. If the market keeps sliding Wayfair is one to watch. I am still learning about the markets & trading. Trading anything involves potential risk of loss and sometimes high levels of stress even when you are correct. Please do not trade based on anything you read on this site. This is an attempt for me to write my own thoughts down in order to capture my thinking and learn from my many mistakes. Learn more about me, me, me. Scores.org, Proudly powered by WordPress.